Upper Beckett Falls is a Ribbon Falls and Cascade. It has not been measured, but its height is approximately 10 metres (30 feet) and its crest width approximately 1.5 metres (5 feet). Its flow is prominent during rainfalls and the winter snow melt. 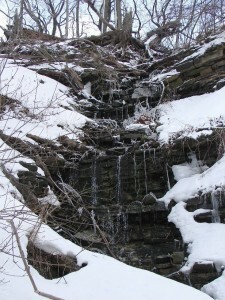 Upper Beckett Falls is also known as Auchmar Falls. Upper Beckett Falls was “discovered” by David Wootton in 2008. 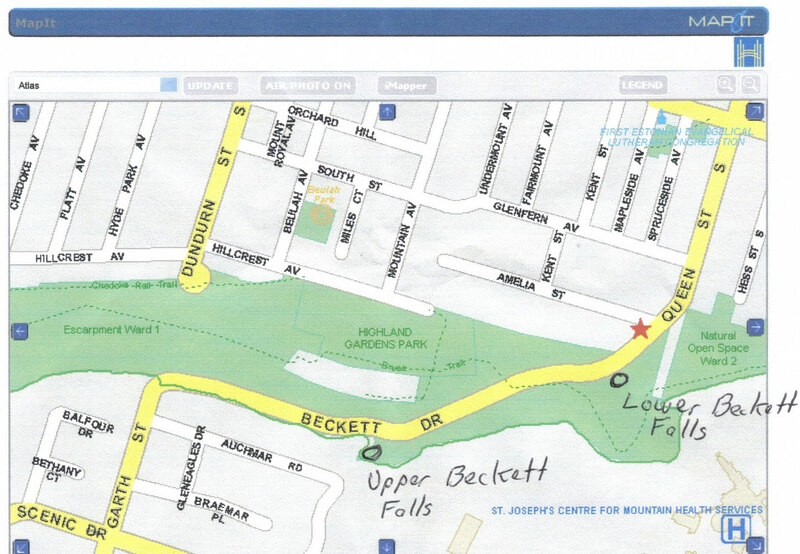 It is named after Beckett Drive as well as a gentleman named Beckett who owned the surrounding lands in the early 1900s. Upper Beckett Falls is located on the east side of Beckett Drive in the first ravine on your right side as you drive down the escarpment from Garth Street along Beckett Drive. Map of Beckett Falls featuring the upper and lower falls.